The following is an excerpt from a recent article Tamara McCleary wrote for DialogTech. I speak extensively on the power of AI, machine learning, big data, martech, and engagement on social media to drive sales conversions. Like anything I advocate in the sales and marketing sphere, my number one philosophy in moving the needle on the business bottom line is business growth through relationships. Genuine, real, and authentic engagement with prospects and clients. Consistent and relevant engagement with customers not only drives new sales, it is absolutely essential for up-selling across verticals, as well as decreasing customer churn. To build solid relationships with our prospects and customers, we must get to know and understand them. One of the biggest mistakes I see with companies is being too impersonal and corporate in an era where people are craving transparency and a human feel from companies. 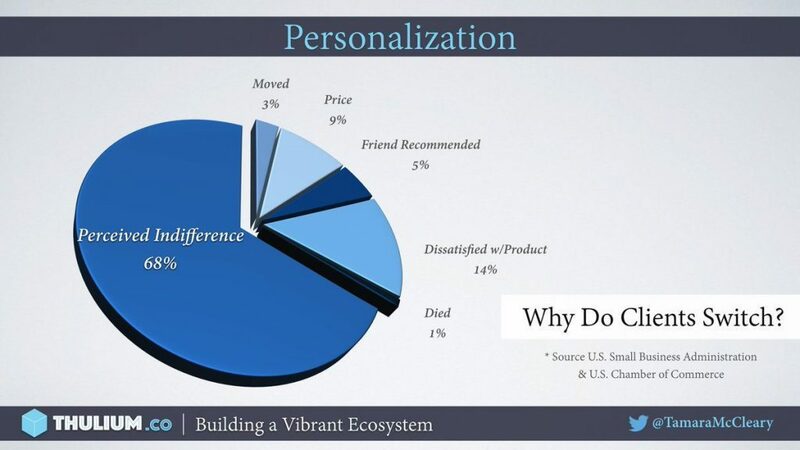 One of the most popular studies from my talks, sourced through the U.S. Small Business Association and U.S. Chamber of Commerce, depicts the power of customer personalization and what drives customers to switch brands. Only 14% of customers switch brands because of dissatisfaction, and fewer still (9%) switch brands due to pricing considerations. The primary driver for customer churn is perceived indifference by the company, resulting in a whopping 68% of customers switching brands due to feeling unloved and unappreciated. So if dissatisfaction and pricing are not the motivator of brand loyalty, what is? Relationships, trust, and a feeling of being connected in some way to the organization. Read the rest of this article here at DialogTech.